Both these voices were centrifugal forces at Motown. Worlds revolved around them, including mine. Perhaps yours, too. 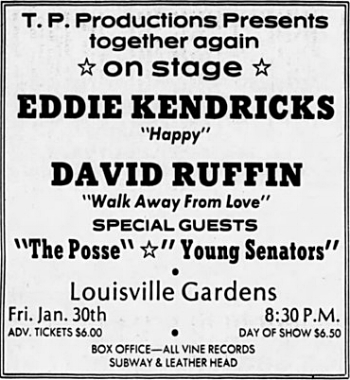 Levi was a revelation from the moment he stepped to the microphone for “Baby I Need Your Loving.” But David in “Walk Away From Love” – when he demolishes any notion of calm acceptance of life’s tangles and twists – that was unexpected because by 1975, it seemed as if we’d heard everything he could deliver. The cabasa! That hypnotic piece of percussion which, with those dark acoustic piano notes, is part of the pull of “Walk Away From Love” from the very start. Van McCoy left nothing to chance, according to Kipps, including the choice of session musicians. “We always wanted to use the top guys,” he recalled, “although you have to remember that some of them weren’t necessarily the top guys when we started working with them.” What made the professionals so attractive “was that they were so much faster and quicker.” Among them on the Who I Am sessions were Gordon Edwards on bass, Eric Gale and Hugh McCracken on guitar, Steve Gadd on drums, and Richard Tee, whose fingers it may be (or perhaps even those of McCoy himself) playing that dark piano. McCoy and Kipps had been working together for several years by this time, having become acquainted through a Washington, D.C. vocal group, the Presidents, for which Kipps sought a record deal. For his part, McCoy had during the 1960s become a remarkably successful writer of songs, cut by the likes of Aretha Franklin, Lesley Gore, Jackie Wilson, Jay & the Americans, Betty Everett and Bobby Vinton – and also Florence Ballard, after her exit from the Supremes. “When Van and I met, he had been producing and arranging for a long time, and he had a great many contacts in the business,” recalled Kipps, a former journalist who was McCoy’s junior by some eight years, and senior by height (he was 6’ 8” tall). With the formation in 1971 of their joint venture, White House Productions, Kipps began renewing those contacts. “Suzanne de Passe was in A&R at Motown,” he noted, “and looking for someone to produce David Ruffin. She knew Van from the past, and we met with her. A deal was made.” The album was recorded at Media Sound in four days during June 1975. “Walk Away From Love” was not composed for the Motown star; it had been previously been made by a group which McCoy produced, the Choice 4. “I had written it just prior to making the [Motown] deal,” said Kipps. “We played it for David, and he immediately loved it.” The Choice 4 version was slower; with Ruffin, “it got a little bit faster than I had originally intended. [But] it worked out very well. That often happens – tempo is a very changeable thing when you’re in the studio, and songs tend to seek their own level as to what feels good. The singer and the salesman stayed in touch after the latter left Motown in 1972, when the firm relocated to Los Angeles. Three years on, Gordy rehired Ales, and “Walk Away From Love” became a top priority for the new administration. 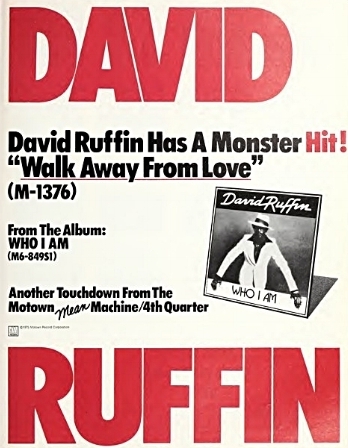 The result was the biggest-selling single of Ruffin’s solo career – a Top 10 hit on both sides of the Atlantic – and the finest moment of his post-Temptations years. Similarly, Who I Am outsold its predecessors when released soon afterwards. It included five Van McCoy compositions, a second by Kipps (the title track) and Ruffin’s self-immolating performance of “Statue Of A Fool,” an old-school country & western number written by Jan Crutchfield.